The clocks now changed, the weather has also. Summer has ended – but CBA North has been busy. Whilst we put together more news of our own activities, and look forward to carrying your news for others to hear of, CBA North Committee has also been slightly changing. More details in the next email. Further regular local society events of our group members, and more, continue to be added to our Events page on the website throughout the year. This lists some events through to May next year; if you would like something added, please feel to get in touch. 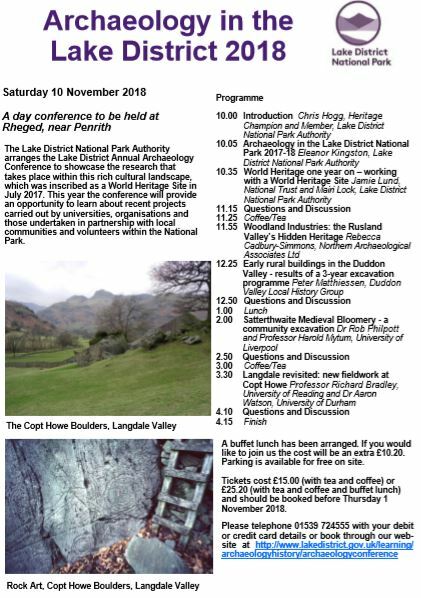 Louise Martin, who spoke at our April 2017 conference, now of the Lake District National Park Authority, has written to us with a poster of the park’s annual conference. Please note the closing date for booking which is close at hand this week. 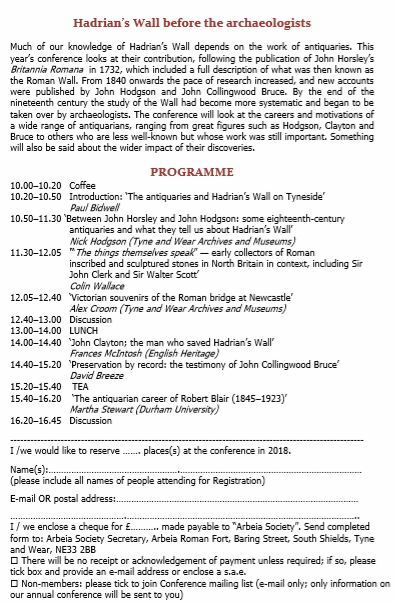 Paul Bidwell, who gave a quick resume of last year’s Carlisle meeting of the Study Group for Roman Pottery, has also sent us a pair of posters for the Arbeia Society’s conference this year. A quick question for you – feedback is always helpful from members and others. Would you like to see more emails at irregular intervals as we become aware of events? Or would you like less emails at more regular intervals? Your answer will help in the timetabling of the behind the scenes of work of CBA North Committee who, of course, welcome your views at any time. We’ll let you know the results also in our next email. 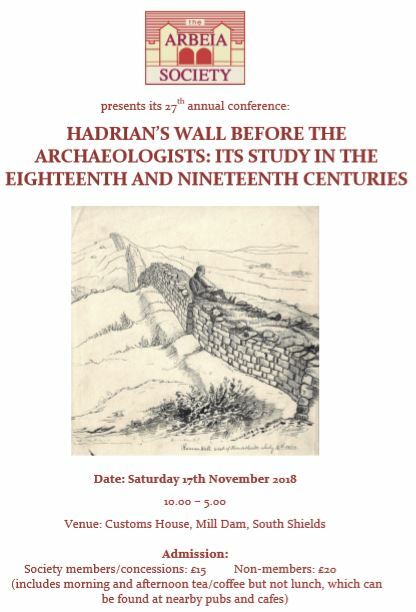 This entry was posted in E Newsletter and tagged antiquarian, Arbeia, Archaeology, conference, Hadrian's Wall, Lake District National Park, Medieval, Prehistoric, Roman, World Heritage Site on October 30, 2018 by cbanorth. [Though the Cumberland and Westmorland Antiquarian and Archaeological Society are not a CBA North member, we’ve been passed details by Professor Stringer of the forthcoming 150th Anniversary of the society, so see – and enjoy the links of – that below]. As you may know, the Cumberland and Westmorland Antiquarian and Archaeological Society is celebrating its 150th Anniversary this year. We have a full programme of events appropriate to such a commemoration, and are naturally keen to ensure the widest possible publicity. The Society would therefore be most grateful if you felt it to be appropriate to post on your website a link to our Anniversary webpage. The URL is http://cumbriapast.com/cgi-bin/ms/main.pl?action=150year. interest to your members, and I hope that you can also draw it to their attention. This entry was posted in E Newsletter and tagged antiquarian, Archaeological Data Service, Archaeology, cumberland, Cumbria, transactions, Westmorland on March 28, 2016 by cbanorth. The Archaeology Data Service and the Cumberland and Westmorland Antiquarian and Archaeological Society have announced the release of the Cumberland and Westmorland Antiquarian and Archaeological Society Transactions archive. For further details of this are on the ADS website, see http://dx.doi.org/10.5284/1032950 Here you will find all of the Transactions volumes published from 1874 up to 2006, with the years 2007-2014 articles available in abstract form. This entry was posted in E Newsletter and tagged ADS, antiquarian, Archaeology, Archaeology Data Service, archive, cumberland, Northumberland, transactions, Westmorland on August 13, 2015 by cbanorth.